For the song by Radiohead, see 2 + 2 = 5 (song). The phrase "two plus two equals five" ("2 + 2 = 5") is a slogan used in many different forms of media, most notably the 1949 dystopian novel 1984 by George Orwell. In the novel, it is used as an example of an obviously false dogma that one may be required to believe, similar to other obviously false slogans promoted by the Party in the novel. Orwell's protagonist, Winston Smith, uses the phrase to wonder if the State might declare "two plus two equals five" as a fact; he ponders whether, if everybody believes it, that makes it true. The Inner Party interrogator of thought-criminals, O'Brien, says of the mathematically false statement that control over physical reality is unimportant; so long as one controls one's own perceptions to what the Party wills, then any corporeal act is possible, in accordance with the principles of doublethink ("Sometimes they are five. Sometimes they are three. Sometimes they are all of them at once"). The equation 2 + 2 = 4 has been proverbial as the type of an obvious truth since the 16th century, and appears as such in Johann Wigand's 1562 De Neutralibus et Mediis Libellus: "That twice two are four, a man may not lawfully make a doubt of it, because that manner of knowledge is grauen [graven] into mannes [man's] nature." René Descartes' realm of pure ideas considers that self-evident idea such as two plus two equals four may, in fact, have no reality outside the mind. According to the First Meditation (1641), the standard of truth is self-evidence of clear and distinct ideas. However, Descartes questions the correspondence of these ideas to reality. In his play Dom Juan (1682), Molière's title character is asked what he believes. He answers that he believes that two plus two equals four. The mirror-image of this—that 2 + 2 = 5 is the archetypical untruth—is attested at least as early as 1728. Ephraim Chambers' Cyclopædia, or an Universal Dictionary of Arts and Sciences, published in that year, follows its definition of the word absurd with this illustrative example: "Thus, a proposition would be absurd, that should affirm, that two and two make five; or that should deny 'em to make four." Similarly Samuel Johnson said in 1779 that "You may have a reason why two and two should make five, but they will still make but four." The first known sympathetic reference to the equation 2 + 2 = 5 appears in an 1813 letter by Lord Byron to his soon-to-be wife Anabella Milbanke in which he writes, "I know that two and two make four—& should be glad to prove it too if I could—though I must say if by any sort of process I could convert 2 & 2 into five it would give me much greater pleasure." Although the phrase "2 + 2 = 5" had earlier been used to indicate an absurdity in general, its use within a political setting is first attested at the dawning of the French Revolution. Abbé Sieyès, in his What Is the Third Estate? (1789), mocked the fact that the Estates-General gave disproportionate voting power to the aristocracy and the clergy in with the following analogy: "Consequently if it be claimed that under the French constitution, 200,000 individuals out of 26 million citizens constitute two-thirds of the common will, only one comment is possible: it is a claim that two and two make five." Victor Hugo used this phrase in 1852. He objected to the way in which the vast majority of French voters had backed Napoleon III, endorsing the way liberal values had been ignored in Napoleon III's coup. In his 1852 pamphlet, Napoléon le Petit, he writes: "Now, get seven million five hundred thousand votes to declare that two and two make five, that the straight line is the longest road, that the whole is less than its part; get it declared by eight millions, by ten millions, by a hundred millions of votes, you will not have advanced a step." Russian writer Fyodor Dostoyevsky is known to be influenced by Hugo and his Napoléon le Petit. In Dostoyevsky's Notes from Underground (published in 1864), the protagonist implicitly supports the idea of two times two making five, spending several paragraphs considering the implications of rejecting the statement "two times two makes four". His purpose is not ideological, however. Instead, he proposes that it is the free will to choose or reject the logical as well as the illogical that makes mankind human. He adds: "I admit that twice two makes four is an excellent thing, but if we are to give everything its due, twice two makes five is sometimes a very charming thing too." The idea seems to have been significant to Russian literature and culture. Ivan Turgenev wrote in Prayer (1881), one of his Poems in Prose "Whatever a man prays for, he prays for a miracle. Every prayer reduces itself to this: Great God, grant that twice two be not four." Also similar sentiments are said to be among Leo Tolstoy's last words when urged to convert back to the Russian Orthodox Church: "Even in the valley of the shadow of death, two and two do not make six." Even turn-of-the-century Russian newspaper columnists used the phrase to suggest the moral confusion of the age. Russian anarchist Mikhail Bakunin in God and the State (1882), classifies Deism as: "Imagine a philosophical vinegar sauce of the most opposed systems, a mixture of Fathers of the Church, scholastic philosophers, Descartes and Pascal, Kant and Scottish psychologists, all this a superstructure on the divine and innate ideas of Plato, and covered up with a layer of Hegelian immanence accompanied, of course, by an ignorance, as contemptuous as it is complete, of natural science, and proving just as two times two make five; the existence of a personal God." In The Reaction In Germany (1842) Bakunin compares the behavior of Compromising Positivists to the one of Juste-milieu at the beginning of the July Revolution quoting a French journal: "The Left says, 2 times 2 are 4; the Right, 2 times 2 are 6; and the Juste-milieu says, 2 times 2 are 5". Deux et deux font cinq (2 + 2 = 5) was the title of a short story collection by French absurdist writer Alphonse Allais published in 1895. Similarly, a 1920 art manifesto by Russian imaginist poet Vadim Shershenevich was titled 2 × 2 = 5. The Soviet Union began its first five-year economic plan in 1928. Its goals were ambitious from the start, seeking the immediate transformation of the USSR into an industrial nation. The consequences for underperformance during the plan were severe; managers who admitted missing their targets, even as those targets were revised upward, could be charged with the crime of 'wrecking'. After statistics from the first two years indicated that the plan was ahead of schedule, Joseph Stalin announced that the plan would be completed in four years. 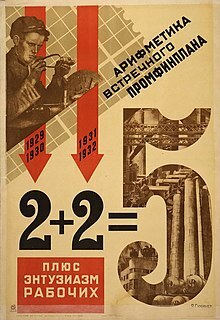 Propagandist Iakov Guminer supported this campaign with a 1931 poster reading "Arithmetic of an alternative plan: 2+2 plus the enthusiasm of the workers=5". Stalin declared the plan a success at the beginning of 1933, noting the creation of several heavy industries. George Orwell may have been influenced by this poster. Nazi theory indeed specifically denies that such a thing as "the truth" exists. ... The implied objective of this line of thought is a nightmare world in which the Leader, or some ruling clique, controls not only the future but the past. If the Leader says of such and such an event, "It never happened" – well, it never happened. If he says that two and two are five – well, two and two are five. This prospect frightens me much more than bombs. In the view of most of Orwell's biographers, the main source for this was Assignment in Utopia by Eugene Lyons, an account of his time in the Soviet Union. This contains a chapter "Two Plus Two Equals Five", that referred to Guminer's slogan. However, Orwell spoke of the Nazis, so he may have been making reference to the Reichsmarschall Hermann Göring, who once, in a debatably hyperbolic display of loyalty to Adolf Hitler, declared, "If the Führer wants it, two and two makes five!" In presidential debates prior to the 2009 Iranian presidential elections, reformist candidate Mir-Hossein Mousavi accused his interlocutor, president Mahmoud Ahmadinejad, of being illogical and said: "If you ask [the president] what two by two makes he would answer five." In the following days, one of the slogans chanted by Mousavi's supporters was "two by two makes five!" Media critic Andrew Keen uses the phrase in his 2007 critique of Wikipedia's policy to let anyone edit. He believes, along with Marshall Poe, that this leads to an encyclopedia of common knowledge, not expert knowledge. He believes the "wisdom of the crowd" will distort truth. In 2017, Italian Catholic priest Antonio Spadaro, a close associate of Pope Francis, tweeted "Theology is not #Mathematics. 2 + 2 in #Theology can make 5. Because it has to do with #God and real #life of #people..." This remark was taken by many traditionalist Catholics to be referring to alleged contradictions between certain interpretation of Amoris laetitia, an apostolic exhortation on how divorced and remarried Catholics can return to the church, and long standing Catholic doctrine on marriage, remarriage, and divorce. Some characterized Spadaro as alleging that one could act counter to the doctrine of the Catholic church if they felt that God allowed them to do so, in spite of any moral of theological contradictions encountered. Others have defended him, claiming that he was merely referring to the Catholic view that God will never be able to be perfectly comprehended by human reason alone. Others compared him humorously to Rex Mottram, a character in Evelyn Waugh's 1945 novel Brideshead Revisited. In the novel, Mottram, during his catechesis as he disinterestedly prepares to enter the Catholic church to marry another main character, makes no effort to rationally ascertain any aspect of the faith, attributing all contradictions to his sinfulness. In Ayn Rand's Atlas Shrugged (1957), the hero John Galt posits that "the noblest act you have ever performed is the act of your mind in the process of grasping that two and two make four". Popular English alternative rock band Radiohead used the slogan as the title for the opening track on their 6th studio album Hail to the Thief (2003). In the Star Trek: The Next Generation episode "Chain of Command, Part II" (1992), Captain Picard is tortured by a Cardassian in a manner similar to the torture of Winston Smith by O'Brien from Nineteen Eighty-Four. During the episode, the Cardassian officer tries to coerce Picard to admit seeing five lights when in fact there were only four. Picard valiantly sticks to reality. Near the end when Picard is about to be brought back to his crew, he defiantly declares, once again, "There!... Are!... Four!... Lights!" However, later in a counseling session with Troi, Picard admits that he believed he did see five lights at the end. In the Iranian short film Two & Two (2011), a teacher in an authoritarian school uses "2 + 2 = 5" as tool to instill conformity. In the video game Orwell, the achievement '2+2=5' is unlocked for ensuring the public acceptance of the Orwell surveillance system and the eradication of Thought, a prominent anti-government movement, therefore ensuring the continued and total control of The Nation's totalitarian government. Brazilian songwriter Caetano Veloso wrote a song called "Como 2+2" ("like 2+2", in Portuguese), in which one of the verses translates as "everything allright like 2 + 2 are 5", a reference to the dictatorship that ruled Brazil then. Dostoevsky's dialogue about two times two equaling five is recited in the 2018 HBO movie Fahrenheit 451. In business texts about synergy, "2 + 2 = 5" is used without irony to indicate that the outcome of a collective effort is greater than the sum of individual efforts. Asch conformity experiments – for more on how the influence of a majority can affect how a single person thinks. ^ a b Wilson, F. P. (1970). The Oxford Dictionary of English Proverbs (3rd ed.). Oxford: Clarendon Press. p. 849. ISBN 0198691181. ^ "Descartes' Meditations Home Page". Wright.edu. 27 July 2005. Retrieved 1 February 2012. ^ "Moliere Don Juan Adapted by Timothy Mooney". Moliere-in-english.com. Retrieved 1 February 2012. ^ Chambers, Ephraim (1728). Cyclopaedia; or, an Universal Dictionary of Arts and Sciences...Volume the First. London: James and John Knapton et al. p. 11. Retrieved 25 December 2016. ^ Byron, George Gordon (1974) [Written 1813–1814]. Leslie A. Marchand (ed.). Alas! the Love of Women: 1813–1814. Belknap Press. p. 159. ^ Keith M. Baker; John W. Boyer; Julius Kirshner (15 May 1987). University of Chicago Readings in Western Civilization, Volume 7: The Old Regime and the French Revolution. University of Chicago Press. p. 154. ISBN 978-0-226-06950-0. ^ Seraphita by Honoré de Balzac. ^ Long, Roderick T. "Victor Hugo on the Limits of Democracy". Archived from the original on 15 January 2012. Retrieved 5 December 2011. ^ "Notes from the Underground: Part I: Chapter IX by Fyodor Dostoevsky". Classic Reader. Retrieved 22 May 2018. ^ e.g. Novoe vremia newspaper ("New Times"), 31 October 1900. ^ The Communist Manifesto and Other Revolutionary Writings. Dover Publications. 2003. p. 199. ISBN 0486424650. ^ Bakunin, Mikhail Aleksandrovich. Selected writings. Grove Press : distributed by Random House. ^ Bakunin, Michail (1842). "The Reaction in Germany From the Notebooks of a Frenchman". The Anarchist Library – via Internet Archive. ^ Meyers, Jeffrey (2010). Orwell: Life and Art. University of Illinois Press. p. 149. ISBN 9780252090226. Retrieved 13 June 2016. ^ Allais, Alphonse (1895). Deux et deux font cinq (2 + 2 = 5) (in French). Ollendorff. ^ Шершеневич, Вадим (1920). 2 × 2 = 5: листы имажиниста (in Russian). ^ Stalin, Joseph (June 1930). Political Report of the Central Committee to the Sixteenth Congress of the C.P.S.U.(B.). Pravda, No. 177. Retrieved 10 October 2014. ^ Stalin, Joseph (7 January 1933). Joint Plenum of the C.C. and C.C.C., C.P.S.U.(B.) January 7–12, 1933: The Results of the First Five-Year Plan. Foreign Languages Publishing House, Moscow. Retrieved 10 October 2014. ^ Cohen, Steve. Deportation is Freedom! : The Orwellian World of Immigration Controls. Jessica Kingsley Publishers. p. 173. ISBN 9781843102946. ^ a b Orwell, George. "Looking back on the Spanish War". orwell.ru. ^ Lyons, Eugene (1938). "XV. Two Plus Two Equals Five". Assignment in Utopia. Transaction Publishers. p. 240. ISBN 9781412817608. ^ "Hermann Göring". Museum of Tolerance Multimedia Learning Center. Archived from the original on 27 December 2004. Retrieved 18 February 2012. ^ Keen, Andrew (2007). The Cult of the Amateur. Doubleday. pp. 39–40, 44. ^ Spadaro, Antonio (5 January 2017). "Theology is not #Mathematics. 2 + 2 in #Theology can make 5. Because it has to do with #God and real #life of #people..." @antoniospadaro. Retrieved 19 October 2017. ^ Rand, Ayn (1999) . Atlas Shrugged. Plume. ISBN 0-452-01187-6. ^ "2+2=5". Green Plastic Radiohead. Retrieved 2 October 2017. ^ Lapidos, Juliet (7 May 2009). "There Are Four Lights!". Slate. ISSN 1091-2339. Retrieved 2 October 2017. ^ "Two & Two. The Manhattan Short". www.manhattanshort.com. Retrieved 2 October 2017. ^ "Synergy - organization, system, company, business, system, History of synergy, Individuals and synergy". www.referenceforbusiness.com.